October has lived up to its turbulent reputation and given us a fair amount of movement to analyze. It can be difficult to know why the market has moved in any given time frame. The good news is that the recent pullback in the market is expected to be temporary by the majority of analysts. Here are some of the factors affecting current market behavior. You’ve likely heard news about the federal funds rate recently. This is a common interest rate banks charge each other for overnight loans. This rate then affects the rates consumers pay when banks lend to them. The Federal Open Market Committee implemented 3 rate increases of 0.25% each to the federal funds rate in 2017. There have been 3 more 0.25% increases in 2018, bringing the current rate up to 2.25%. They would like to see this rate closer to 3% in order to give the committee room to lower the rate during the next economic slowdown. Both housing and auto sales have been impacted by these higher rates. 30-year mortgage rates are up a full percentage point in 2018, as compared to year-end 2017. Rising rates allow investors to shift their stock exposure, while still earning some interest. For example, we’ve seen 1-year CD’s and other short-term savings vehicles increase yields to around 2% annually. Investments leaving stocks does place downward pressure on stock prices. The rate increases have been measured and expected. They are largely priced into the markets, but investors should not be surprised when the market moves some with each new rate increase. Bond funds have a portion of their portfolio maturing throughout the year. As a bond bought 2 years ago matures, it is replaced with a bond yielding higher interest. The bond funds we typically use in client portfolios have seen their interest income increase. This will likely continue in 2019 as newly released bonds will continue to pay higher rates. Rising bond yields mean retired clients can more comfortably cover a 4% withdrawal rate. The biggest driver of stock market performance is earnings, and expected earnings growth. 2018 is shaping up to be one of the best years on record for profit growth in several decades. We have seen earnings releases with growth in same store sales, overall revenue, and/or earnings followed by a stock price drop. Although this is typically unusual, it is rational in the current environment. The most recent tax cut boosted corporate earnings, providing a nice tailwind in an already positive earnings environment. However, that was a one-time boost that will not be repeated. As of November 2nd, 74% of S&P 500 companies had reported 3rd quarter results.2 78% of companies reported greater than expected earnings, and 61% greater than expected sales. The blended third quarter earnings growth rate is 22.5%. That is up from 19.3% at the end of September. Financial news often mentions the “PE ratio” when talking about overall markets. PE stands for price-earnings and reflects what an investor is willing to pay for a stock based on the earnings. A stock with a PE of 10 means investors are willing to pay 10 years’ worth of the company’s earnings in order to own the stock today. If a company is earning $100 annually, then the investor is willing to pay $1,000 for the stock. The PE ratio for the S&P 500 is 15.6. That is right in the middle of the 5-year and 10-year averages of 16.4 and 14.5 respectively. None of this data points to an overvalued market. 2019 earnings are forecast to be about 10% higher than 2018.7 This is about half of what we saw in 2018, but higher than what we’ve seen in most years since the immediate recovery from the 2008-2009 recession. The 10% growth in earnings is expected to provide a combination of some stock price growth and some lowering of PE ratios. Foreign actively does effect the markets, and is the cause of some of the recent pullback. Budget issues in Italy, and the EU in general, escalating tension between Turkey and Saudi Arabia, the trade dispute with China, and concerns over the Chinese economy have all affected the U.S. stock market recently.3 We should not be surprised over market moves as the Brexit process continues. Activity in the Middle East will continue to affect oil prices, and how those prices impact the overall market. International holdings represent a much smaller area of stock market exposure in client accounts than U.S. holdings. This sector had strong performance in 2017, but declined this year. Underperformers in one year often outperform the next, and is part of why we maintain diversified portfolios. We do not see any areas of great concern internationally in terms of stock market effect. Most U.S. investors today recall the market decline of 2008-2009. Many also recall 2000-2002. This understandably leaves some investors nervous when the market declines. Both of those markets were impacted by bubbles bursting. 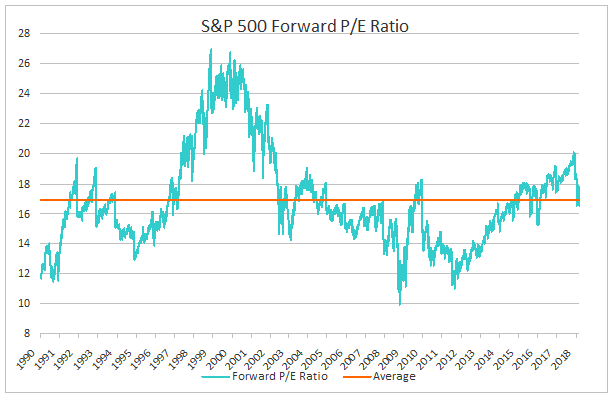 For example, tech stock valuations were far greater in 2000 than they are now, with a NASDAQ PE ratio of 175 in March 2000.4 The current PE is around 20.5 While investors have various concerns over the future of the market, valuations are not extended. Markets will decline in value and that can be nerve wracking. This is why we design portfolios that are blends of equity, bond, value, and growth securities for clients. The S&P 500 declined by about 9% from October 9th through October 29th.6 Client accounts with a diversified portfolio did not see this level of decline. As of November 5th, the S&P 500 had regained about half of the drop, and is widely expected to continue to recover lost ground. Analysts continue to see companies making money, and opportunities to share in this environment through the rest of 2018 and well into 2019. We do not see any reason to exit the market at this time, but rather view this as normal cyclical activity. 2017 has been a year of surprises. An anticipated market pullback did not materialize this year. Instead, we saw a year of above average growth in market price. The S&P 500 (a widely followed basket of 500 U.S. company stocks) ended at 2673.61, a gain of 21.83% on the year. A round-up of statistics shows GDP remained at a steady rate with the third quarter at 3.2%1. Unemployment is at historically low rates, with December’s figure at 4.1% per the Bureau of Labor Statistics (BLS). Lastly, foreign companies did well in 2017. The International Monetary Fund (IMF) shows most mature economies with slow growth, while developing countries typically saw higher growth rates that bode well for their economies.2 2017 markets reflected this growth as the international sector posting its biggest gain since 2009. What can we expect of the new year? A recent issue of a research service we subscribe to summed up bull vs. bear market conditions in a helpful manner. The market tends to contract when we see a combination of tight money, rising rates, high inflation, and rapid growth. We do not currently meet these criteria. The Fed is slowly scaling back measures taken during the recession at a measured pace. Money supply is slowly tightening as the Fed increases interest rates. Rates are inching up and do not have us in an era of either tight money or truly rising rates. Inflation remains low, with the personal consumption expenditure (PCE) price index at 1.5%3. GDP continues at measured rates in the 2-3% range each quarter. The outlook for 2018 real gross domestic product (GDP) is in the 2-3% range as well. All of this together shows a picture of slow, steady grow rather than the beginnings of a pullback. There remains the possibility of a correction in the market, with analysts looking towards a temporary event like we saw in early 2016 rather than a sustained bear market. There is an expectation of greater earnings due to the recent corporate tax cut, although much of this is seen as already priced into the market. Increased earnings will largely result from balance sheet reshuffling in the form of debt reductions, stock buybacks, and mergers or acquisitions4. These will be one-time events that will solely enhance 2018 earnings. Analysts expect the resulting gains to be temporary, lasting perhaps 12-18 months. This, in conjunction with historically high consumer sentiment, bodes well for the 2018 market. It is helpful to pick a company benefiting from the tax changes in order to see the details. Bank of America has been in the news recently as they announced an additional employee bonus of $1,000 for about 145,000 employees5, a total cost of $145 million. Goldman Sachs estimates that Bank of America will see earnings grow by 14% due to the cut. That would translate into earnings increases of about $2.5 billion. Roughly 6% of the $2.5 billion received by the corporate tax cut will go towards employee wages. Bank of America also noted a $5 billion increase in stock buybacks, above the $12 billion repurchase amount announced earlier in the year.6 Stock buybacks are used to increase earnings per share, which results in higher stock prices. In summary, Bank of America will spend an extra $145 million on employee wages and spend $17 billion on stock buybacks in 2018. The real world results from the tax cut will become clearer in 2018 as accountants have more time to delve into the provisions. As with any change, there will be winners and losers due to the changes. The overall effect does appear to be a boost for a number of companies that will increase near-term earnings. Foreign markets saw meaningful progress in 2017 from both consumer spending and corporate profits. We believe many international markets are 3 or more years behind the U.S. in their economic activity. We expect to maintain a fair degree of international exposure in client accounts in order to capture this growth. There are a number of fiscal unknowns due to the changing of the U.S. tax code. Accountants all over the country are working hard to analyze the impacts. However, the bottom line for stock market growth is always corporate earnings. Earnings have been rising and are expected to continue to do so. There will likely be a modest boost to corporate earnings and overall economic activity this year due to the cuts. The full impact of these changes will become clearer as we move through the year. We agree with analyst expectations of low level growth within the domestic market next year. We will continue to posture client accounts to capture some of this growth, while protecting against downside events. It is important to maintain downside protection in portfolios given that growth is expected to be limited. We may see a pullback in the markets in 2018 or an unplanned outside event that causes disruptions. We would view these events as acquisition opportunities. Overall, we expect 2018 to be another year in the plowshare economy. This year’s economic activity actually started in December with a Fed announcement. They expected to raise interest rates ¼ point at three different times in 2017, for a total expected rate increase of ¾%. We then saw a large jump in the January inflation rate. This news created a bit of a scare in the bond market as several analysts felt the Fed had underestimated inflation. There was much speculation that more than three rate increases would be appropriate for 2017. Subsequently inflation figures for both February and March showed much more subdued levels of inflation. January is now viewed as a temporary spike that has not changed the overall expectation for 2017. Rates should rise this year, but at the moderate pace originally outlined by the Fed in December. There are two important metrics to keep in mind when evaluating bonds – interest rates and duration. Duration is linked to how long a bond has until maturity. 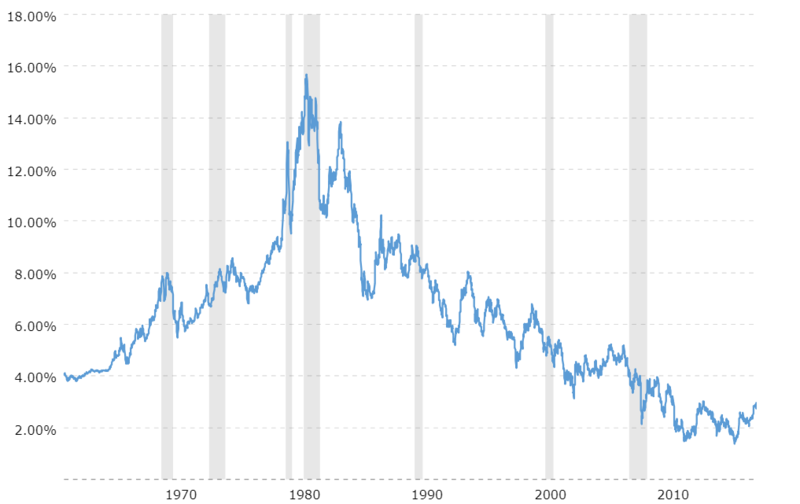 The longer the duration, the less valuable the bond is during times of rising interest rates since newer bonds issued will pay an investor a higher interest rate. We’ve rebalanced bond exposure to shorten duration given the anticipated rate rises. We have also added exposure to floating rate bonds as their values hold up better during periods of rising rates. Unlike traditional fixed rate bonds, floating rate bonds are tied to a benchmark such as LIBOR, Fed Fund or prime rate. These benchmarks can adjust quickly with changes in interest rates. International stocks have underperformed U.S. stocks for the past few years. It may come as a surprise for some investors that international equities have outperformed U.S. equities year-to-date in 2017. The latest GDP figures coming out of Europe and Asia are starting to perk up and show signs of increased growth. These improvements are represented in foreign stock price increases. As of 4/28/17, the S&P 500 year-to-date return was 7.16%, while developed international markets (represented by the MSFCI EAFE index) have returned 9.97%. The MSCI Emerging Markets index – which would include companies in such countries as South Korea, China, South Africa, and India – has returned 13.88% YTD. Even with the recent move up in foreign prices, we find that international markets still have more attractive valuations and more room for growth than their U.S. counterparts. Throughout 1st quarter 2017 we have increased our equity weightings in both international developed and emerging markets positions to take advantage of these growth opportunities. A reasonable case could be made that investors have been accumulating stocks in the aftermath of the November election in anticipation of a number of economic policy changes. There is a wide expectation of a significantly lower corporate tax rate in the near future. A reduction in individual tax rates could see discretionary income increase if personal taxes are reduced. An opportunity to see a repatriation of a significant portion of the $2.5 trillion in U.S. based company profits residing abroad could benefit the economy if handled carefully. Healthcare reform could be done in such a way as to benefit the economy. Lastly, widely discussed infrastructure spending would be a shot in the arm to several economic sectors. Despite the widespread investor anticipation of movement on each of these items under a Republican president, congress, and senate the actually progress has been fairly slow to date. It was hoped that tax reform would largely take shape in April. That has not happened. While some progress has been made on outlining changes to both the individual and corporate tax structures, many details have yet to be hammered out. 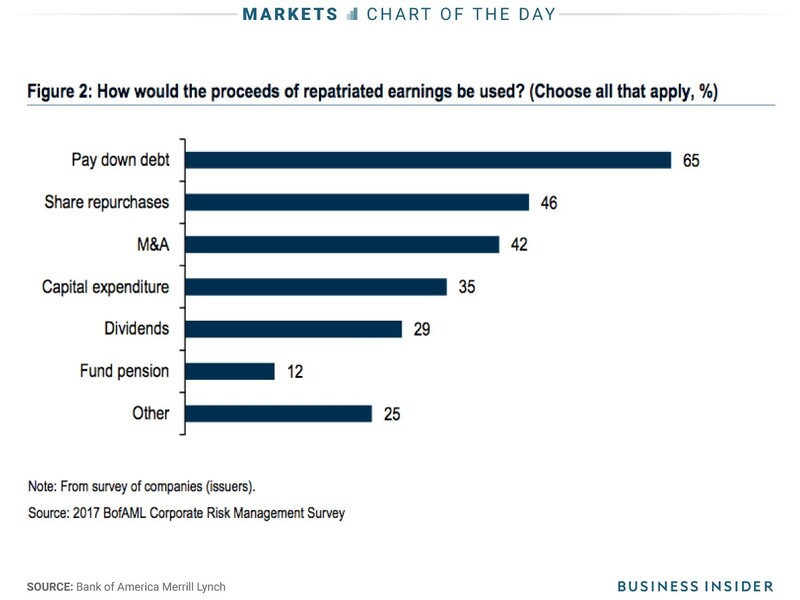 Previous foreign profit repatriation resulted largely in company stock buybacks rather than capital expenditures. A plan that would both allow for repatriation and ensure that companies use this move for job creation has yet to be worked out. Proposed healthcare changes ran into a very fragmented Republican congress and are still in limbo. Tax changes may very well see the same multiple camps arguing over details, each demanding their view be adopted. There are also concerns over the president’s tax changes significantly adding to the national debt. Many conservative members of congress were elected on their pledges of fiscal responsibility and will only accept revenue neutral changes. Finally, infrastructure spending involves a significant amount of planning and getting bids from various construction firms. Analysts now do not expect to see the beginning of an infrastructure plan until 2018 at least. The outlook for 2017 real gross domestic product (GDP) is in the 2-3% range. If tax reform is delayed until late 2017 or early 2018, the probability favors GDP to track towards the lower end of the 2-3% range. Recent quarterly earnings have generally been better than expected. While there are always winners and losers each quarter, our research services have shown a much longer list of winners than losers each day figures have been reported. This does not mean we are seeing strong growth. Technology companies in particular reported greater earnings this past quarter and the sector is poised for growth, but other sectors show a lack of revenue growth. That lack of growth does not bode well for future earnings. In summary, we are in a fairly mature economy, and are now in the 9th year of an expansion phase. That does not mean we see any indications of a near-term precipitous drop in market values. U.S. stocks are a bit expensive by historic standards, but not excessively so. We did see an uptick in sentiment after the election amongst sectors of the population that buy stocks. These positive hopes have yet to turn into concrete reality that will drive economic growth. Positive sentiment is an emotionally based metric and can erode as easily as it grows, but that does not mean we should expect to see a market crash. We are in a wait and see period in which economic policy changes that could affect the economy in several ways are pending. It can be frustrating to wait for more concrete direction, but waiting periods do eventually end. In the meantime, we have adjusted bond and international holdings for clients to reflect the movement we have seen in those sectors. We remain in a “plow horse” economy, with slow, steady growth. While that is not exciting, it is not a bad place to be. The U.S. economy should finish 2016 with final GDP growth figures of 1.6-1.7%.1 This is hardly a barn burner, but has been a continuation of the slow, steady growth seen for several years. Current 2017 forecasts estimate GDP in the 1.8-2.2% range.2 However, it would be wise to note that projections for future years have been somewhat optimistic since the recovery. For example, The Wall Street Journal Economics Survey of December 2015 predicted 2.6% GDP growth for 2016. We will have to wait and see how 2017 compares to the expectations. The market will continue to focus on earnings, interest rates, inflation, and taxes as we move into 2017. The year should keep analysts busy given the talk of significant changes to the tax structure. President Elect Trump is proposing the lowering of personal and corporate taxes for most people and companies. In addition, a proposal to allow U.S. companies to move foreign earnings held abroad back to the United States as a special, lower tax rate will be worth watching. This proposal could bring back hundreds of billions of dollars to the United States. Governmental spending at the state and local levels has been constrained by increased pension and healthcare costs for many areas of the country. This has limited the spending of these local entities for other programs. It is hoped that Trump stimulus programs could be a positive for state and local governments. It is likely that such stimulus programs will contribute to the national debt. Specific policy proposals will allow analysts to determine the probable effects of both spending and debt increases at that time. Inflation and rising interest rates are areas to watch for as a drag on 2017 GDP. A ¼ point rate increase (0.25%) by the Federal Reserve in December is widely anticipated. Two further ¼ point increases in 2017 (as is anticipated) would bring the federal funds rate to 1.0% by year end. Housing markets are expected to see less appreciation as a result. Moving the national average for mortgage interest rates from 4% to 5% still leaves this rate historically low. However, it is also a 25% increase in borrowing costs. For example, a mortgage of $300,000 costs the borrower $12,000 annually at 4%. It jumps to $15,000 annually at 5%. This is enough of a change to price some buyers out of their local markets. The national real estate average shows price growth of about 6% last year. Markets like Portland, Seattle, and Denver have seen much greater price rises. Expectations are for these markets to slow their growth as buyers reassess what they can afford. At the same time, the combination of full employment and likely increasing energy prices is expected to increase inflation in 2017. Businesses are expected to raise wages, and prices, as they compete for skilled workers. OPEC agreements to limit pumping are expected to hold and help drive up oil prices somewhat. It is hard to gauge exactly how much impact any of these factors will have on next year’s economy, but all are expected to play a part. The financial markets seem to be very confident that better economic news is just around the corner. They seem sure that tax cuts and increased infrastructure spending is a done deal, despite any definitive proposals. Some businesses are anticipating a reduction in regulations they have previously complained of. The new optimism seems to be based on recent proposed appointments of anti-regulation proponents and the creation of the most conservative cabinet in decades. The markets appear to be anticipating profits to be made from the changes these individuals – as well as other likely cabinet picks – would like to make to sectors of our economy. New government policies, even with one party firmly in control, take longer to implement than most people expect. Ideas get watered down and projects can take years to become shovel ready. The United States has been governed by a Republican Congress and President 22.5% of the time since the early 1900’s. The Dow Jones Industrial Average has returned approximately 7% annually during those time frames.2 Markets don’t like uncertainty. They began to move after the election results became clear and investors could trade based on likely governmental policy changes. A number of analysts feel 2016 is finishing with some of next year’s expected gains already priced into the system. We will have to wait and see which of these expectations become reality, and which have been unrealistic hopes. It is certain that 2017 will be a year with some interesting changes to adapt to, and, hopefully, profit from. We wish everyone a happy, enjoyable holiday season as we all reflect on 2016 and mull over the possibilities of 2017. We thought it would be timely to depart from our usual market commentary and instead explore services our office offers that you may not be aware of. Financial planning extends beyond upcoming life events such as a new home purchase, a child entering college, or entering retirement. Most clients desire to leave a legacy for children, extended family, friends, or charitable institutions. Laying the foundation for a transfer of wealth, particularly to younger generations, should occur well in advance of the need, yet these can be difficult conversations to begin. We often see that, without proper planning, family wealth depleted within a generation or two. Our office can help. We are a neutral third party who can explore the best way to discuss your wants and needs with family, attorneys, or other relevant parties. Addressing topics related to multi-generational family trusts, or even who to contact and where to find important documents in case of unexpected events, can provide clarity and assurance in advance of emotionally fraught times. Please let us know if you are interested in beginning a conversation between you, your heirs, and our office. We have attached a summary some people may find helpful when speaking about us to family, friends, or service providers. It is a quick explanation of who we are and what services we provide. Please feel free to send or print a copy of this page for your family members, close friends, CPA, attorney, or anyone else you feel should know about our office. Let us know if you would like us to mail you hard copies of this explanatory page and we will be happy to do so. We wish everyone a happy, enjoyable holiday season. Election Impact – Tuesday’s dramatic U.S. presidential election result has shocked the world. A number of clients have expressed high levels of anxiety due to the outcome. It is important to reiterate that elections by themselves do not decide policy outcomes, nor do they generally direct the long-term health of the economy and the businesses that operate within it. Without knowing which policy proposals will eventually be enacted – and how implementation may play out – making preemptive, emotionally charged investment decisions is more likely to hurt one’s portfolio than help. We have carefully analyzed the performance of the stock-based mutual funds we own for their performance during the 2008-2009 sell-off, choosing funds that held up better than their peers and/or benchmarks during the downturn. One can never assume past performance will be repeated in the future. However, past activity can be a guide to probable reaction to similar future events assuming no great change in mission statement or portfolio manager(s). Diversification – We cannot emphasize enough the importance of having a healthy level of respect for the highly unpredictable nature of the markets over the short-term. We have learned this lesson over 30 years of managing money. The start of this year saw equity markets decline across the globe. Markets had regained the ground lost and returned to a 1-year high by May. Then June saw a sharp Brexit related decline that now appears as a small blip on history graphs. Managed futures holdings provided valuable diversification benefits and reduced risk to client portfolios during these events as they have almost no correlation to broad stock market activity. A diversified portfolio, like that of most of our clients, should hold asset strategies that have positive expected returns and either low or no correlation to each other over the long-term. As a reminder, correlated assets move with each other, while non-correlated assets move independently of each other. For example, stocks and bonds tend to move separately, or even opposite of each other. There are significant benefits to adding assets that have very low or no correlation, even if their expected returns are somewhat lower than that of existing holdings. Managed futures is just one example of how we gain diversification and lower risk by adding assets with low correlation to an existing asset mix. Bonds – Bonds are another diversification tool we use in client portfolios. We expect a gradual increase in interest rates over the next year. Shorter term bonds and bonds with the ability to increase their interest rates, such as floating rate bonds, are sectors we are comfortable holding in client portfolios. Bonds are lower risk assets to hold in case of a stock market sell-off, acting as a shock absorber as money flows from the stock market to bonds. As with managed futures, we have been adding to these asset categories over the past year. Media reports of a change in Federal Reserve policy regarding raising interest rates due to the election outcome are speculative in nature at this point in time. This is currently an area of unknown policy shifts. Summary – We have entered a period of uncertainty linked to possible and probable policy changes. We do not know the nature of these changes yet. Trump’s most recent speech referenced infrastructure spending increases, indicating this is a likely front burner topic to be addressed by the new administration. A measure of clarity in this and other areas will be obtained over the next 60 days as the outline of the new administration takes shape. We have already seen some positive activity as the steep market drop predicted by after-hours and international trading failed to materialize. Many stocks within the financial and energy sectors have seen large gains since the close of the election. In contrast, tech based companies have seen some declines to their valuations. It is too early to react strongly to any of the changes expected to materialize from this election. It would not be prudent to react until new policy positions are noted and the details of these changes are fleshed out. There will undoubtedly be a number of new positions to parse over the coming weeks, but we are not there at this point in time. Now is the time to reflect on what this election shows about the country as a whole and to prepare for the general changes ahead. The employment situation in the United States has slowly, but steadily, been improving since the 2008 recession. The below graph shows initial jobless claims numbers from 1967 through October 2016. As you can see, current initial jobless claims are at the lowest level seen since 1973. The U.S. economy added 156,000 new jobs in September.2 Larger employers (those employing 500+ workers) recently outpaced smaller firms in job creation. Individual sectors do differ in their employment outlook. For example, energy has seen a contraction in employment over the past year while trucking companies note difficulty filling positions even while offering signing bonuses of $5,000 or more. The overall unemployment rate did rise slightly to 5%. However, that rise has largely been attributed to previously discouraged workers reentering the labor market and is not an indicator of a softening job market. Some workers are still struggling despite current job growth rates. Figures noting people who gave up looking for work or who can only find part-time jobs remain flat at 9.7%.3 Much of this can be attributed to the “skills gap”, meaning workers without advanced skills do still have difficulty finding full employment. This figure is not expected to change meaningfully as employers having difficulties filling job vacancies have noted the need for skilled workers within their industries. A tighter labor market for skilled workers is driving wage inflation. Hourly wages have grown by 2.6% over the past year to $25.79/hour, just below the post-recession high.3 The numbers of hours worked per person has also increased. An improvement in both average hourly wages and hours worked is encouraging. Several economists think we may begin to see worker shortages by next spring. Pay increases are expected to continue as companies seek to either fill vacancies or retain skilled workers. This trend is being watched carefully as it may spur an increase in overall inflation, leading to interest rate increases by the Federal Reserve. A ¼ point rate hike is likely in December given these employment trends. The employment trends noted above have been gradual, meaning the upward inflationary pressure and need for the Fed to respond have also been slowly growing. A continuance of current labor market trends is likely to make the Fed more comfortable with future rate increases. However, while these are positive trends with steady momentum, they are still slow moving. While this does make future rate hikes more likely, it is not overwhelming pressure on the Fed to raise rates. While we do expect to see interest rates rise in 2017, we do not expect to see large increases. In summary, the U.S. job market has basically recovered to pre-recession levels. Workers can expect raises as their skills are more in demand and valued greater. The economy is likely to see some upward inflationary pressure due to the tightening job market. We can expect the Fed to respond with measured interest rate increases. Unskilled workers still face employment challenges and are likely to continue to do so.